Sarah’s work is driven by a diverse and fascinating array of interests and experiences. Her love of commercial fishing was born more than a decade ago when she lived on the coast of Chile and got to know the small-scale coastal fisheries of that seafaring nation. Chile has enjoyed success in implementing cooperative and area-based allocation systems, which today are serving as a model for work being done by EDF, Rare and the University of California at Santa Barbara through the Fish Forever partnership. After returning to Rhode Island inspired by her Chilean experience, Sarah worked as a deckhand on lobster boats and then a fluke gillnet boat, before branching out on her own. Today, she is a working commercial fisherman, harvesting conch, oysters, razor clams and quahogs in Rhode Island’s Narragansett Bay from a 12’ skiff or even while paddling a canoe! As much as Sarah loves “the Ocean State,” she confesses a need to escape the summertime madness of its coastal waters in the summertime. True to her love of commercial fishing, she spends her summers in Alaska, another global bright spot of successful fisheries management, to work in a salmon cannery and experience the unique culture and camaraderie of the Alaskan fishing industry. Sarah’s time there has made her active in the ongoing effort to protect Alaska’s marine ecosystems from the proposed Pebble Mine project. Eating with the Ecosystem was born out of Sarah’s experience selling her catch at local farmer’s markets. She found that too many people looking for local foods were only familiar with the more high-profile local species, too many of which have suffered from overfishing. But people were not aware that there are many lesser known species whose populations are healthier, and she wanted to get that message out. During our conversation, Sarah asked if I’d be interested in joining my friend Jeffrey Pierce as the guest speakers at an event she held earlier this month. Like Sarah, Jeff is a commercial fisherman who harvests sea-run herring, a.k.a. ‘alewives’, on a tributary of the Eastern River in Dresden Mills, Maine. Jeff is also the Executive Director and Founder of the Alewife Harvesters of Maine, an industry organization whose Board of Directors I joined in 2010. Alewives are one of my favorite fishes, and one on which EDF has done a wide variety of work. Sadly, in too many places, alewife populations are suffering, and the species was recently proposed for listing under the Endangered Species Act. The petition was ultimately denied, but not without some very serious concerns being raised about the future of these vital links in the aquatic food web. Fortunately, Maine has enjoyed more success with alewife management than any other state, and many of its river fisheries have remained open while most others along the eastern seaboard have closed. Jeff brought some of his sustainably harvested alewives from Maine to Boston for the dinner, which was held at the renowned Lumiere restaurant. Lumiere is owned by Chef Michael Leviton, head of the Chef’s Collaborative. Michael is a kindred spirit of Sarah’s in his commitment to inspiring diners to sample more of the sea’s bounty, thereby spreading harvest pressure more evenly and reducing impacts on overfished species. In addition to the Eating with the Ecosystem event, Michael has hosted a ‘trash fish’ dinner at his Area Four restaurant in Cambridge to convey a similar message. 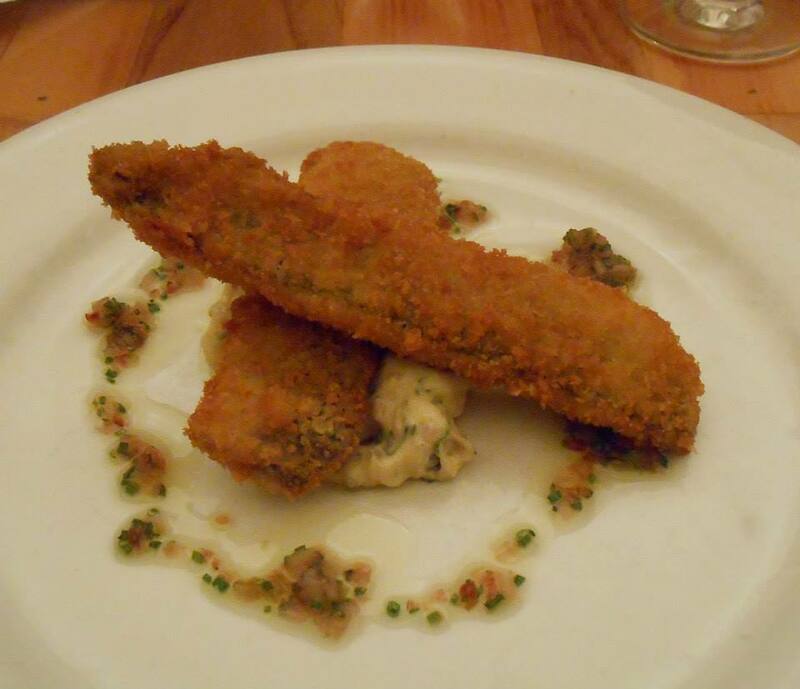 Michael began our dinner with Jeffrey’s alewives, fired crispy and accompanied by a pickled ramp remoulade. That was followed by a chilled monkfish liver torchon and then white hake accompanied by roasted root vegetable, spiced yogurt and harissa vinaigrette. The meal delectable, to say the least, and I, for one, can’t wait until the next Eating with the Ecosystem event to sample more creations using New England’s abundant seafood. With people like Sarah, Jeffrey and Michael hard at work, I’m confident New England’s fishing future will continue to provide such fresh, healthy and tasty offerings. This entry was posted in Domestic, New England. Bookmark the permalink. Both comments and trackbacks are currently closed.